For some odd reason, we have not been cooking at home lately much and have been eating out a ton. Lunch meetings, after work drinks and dinner, weekend brunch, eating out continues on. Don’t get us wrong, we loved every bite (especially our dining experiences at both ad hoc and TBD Restaurant), but we missed the ritual of preparing and building flavors through the culmination of plating and sharing the meal. 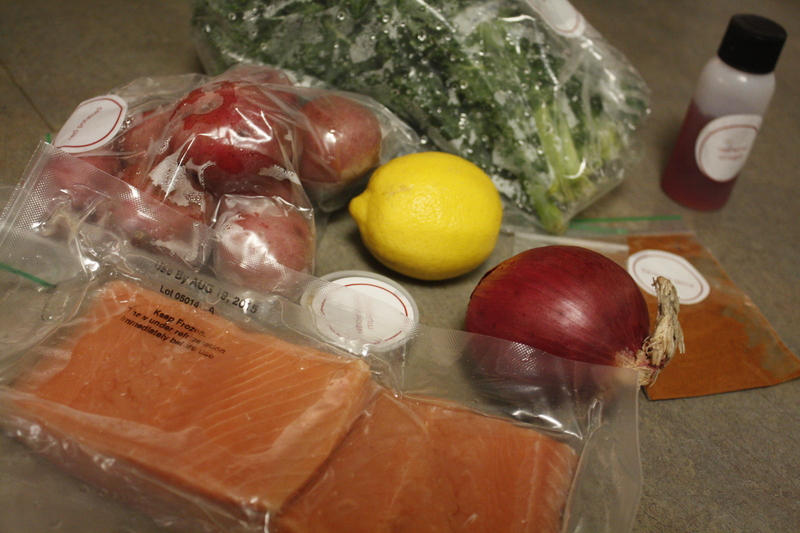 In the spirit of wellness and cooking quick, but tasty gourmet meals at home, we decided to test out two different meal kit delivery services, first Plated, and in subsequent weeks Blue Apron, both based on New York. Many colleagues have been enjoying Blue Apron and bringing their leftover creations to lunch, so our interest has been peaked for some time. After browsing the Plated website, we selected the Berbere salmon and creamy coconut curry. (We chose salmon because we love crispy salmon skin and we had to select the curry dish because we fondly remembered our Smart Cook Thai cooking class in Chiang Mai and look forward to making this in the next few days!) We were quite impressed the flavor profiles of the entire dish. 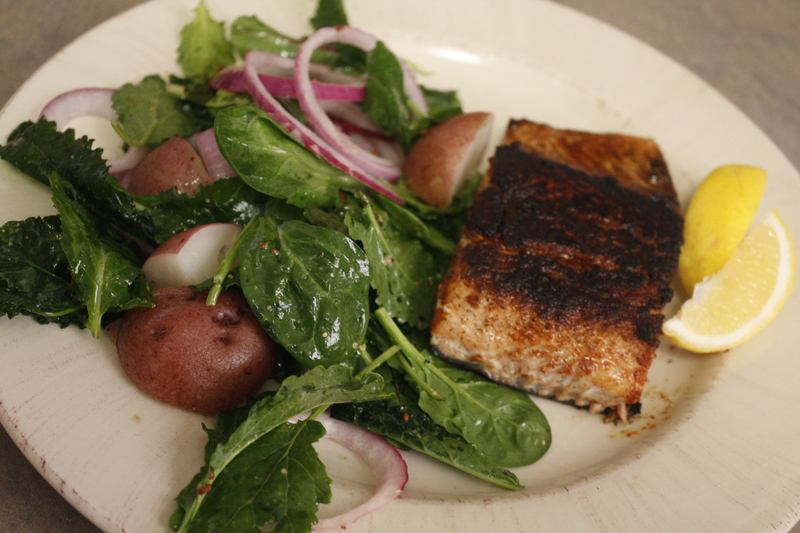 The flakey Berbere salmon had a nicely blackened crust, the tender new potatoes with greens dressing in a mustard dressing with bright and tangy onions. This is definitely a dish we would happily order at a restaurant. What really made this meal special was the Berbere, described on the Plated menu card as is an Ethiopian spice mixture with a warm, spicy-sweet taste. There are many varieties, but most include ground chiles, fenugreek, cloves, ginger, and cardamom. We really appreciated the extra “pro” tip. 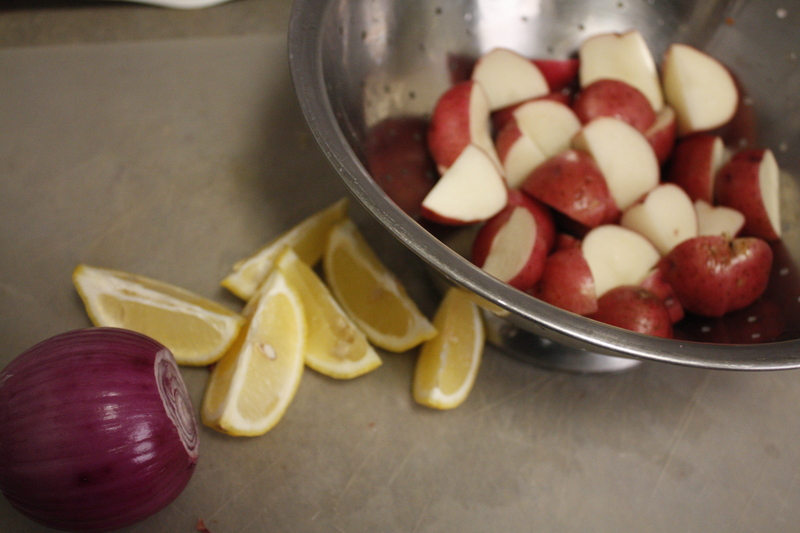 Dressing potatoes while they’re still warm helps them to absorb the maximum amount of ﬂavor. Be sure to read through the entire recipe before you begin cooking. Trust us–you’ll be glad you did! 1. Prepare Ingredients Peel onion and thinly slice. Rinse potatoes and quarter. Rinse kale and tear leaves into bite-size pieces, discarding stems. (We also used a bag of almost expiring power greens from TJ’s and will save the fresher Plated kale for the AM green smoothies). Cut lemon into 8 wedges. (We got 6 wedges out of the smaller lemon). 2. Cook Potatoes Place potatoes in a medium pot and cover with cold water. Add a generous pinch kosher salt (we used sea salt) and bring to a boil over high heat. Cook until fork tender, about 10 minutes. Drain and set aside. 3. Marinate Onion Meanwhile, in a medium bowl, toss onion with red wine vinegar. Set aside to marinate at room temperature for 5-10 minutes. 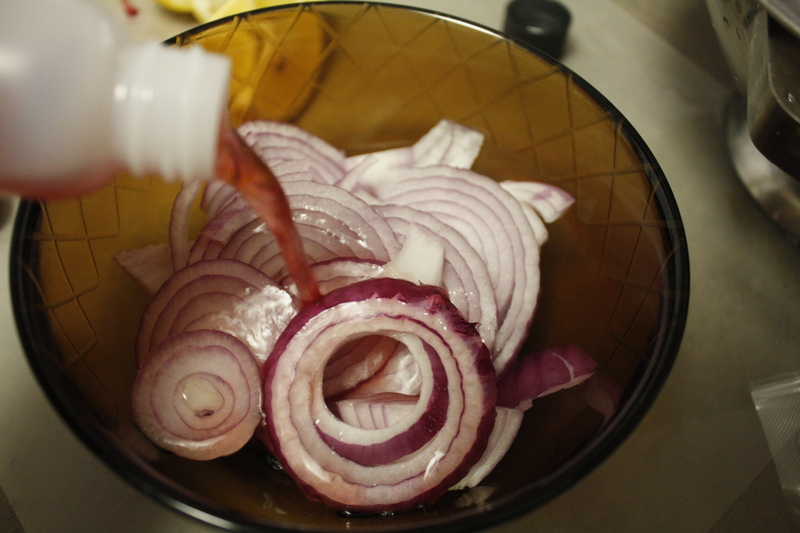 (If we could, we would even marinate them longer for the vinegar to penetrate the onion even more). salt and pepper as needed. Set aside. 5. Cook Salmon Rinse salmon and pat dry with paper towel. (We can not insist enough how important this step is). Season with berbere, kosher salt, and pepper, pressing to adhere. 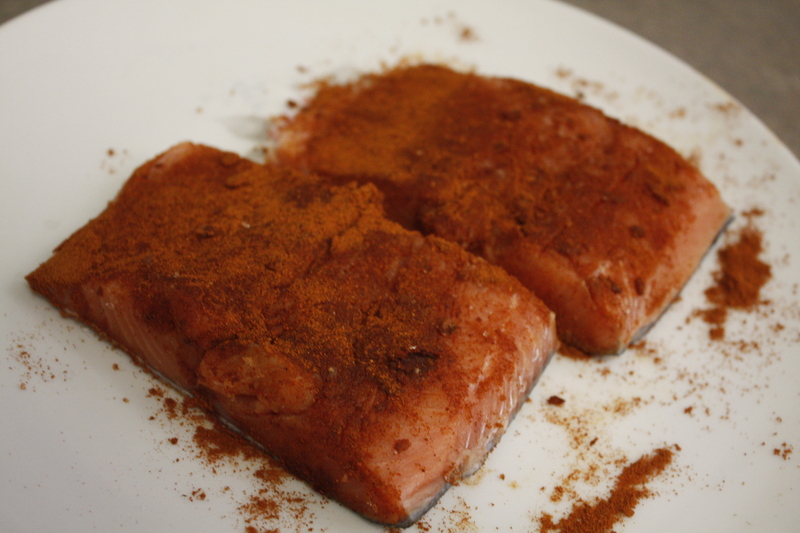 (Anticipate a hand wash after coating the spices on the salmon). Heat 1 tablespoon olive oil in a medium pan over medium-high heat. 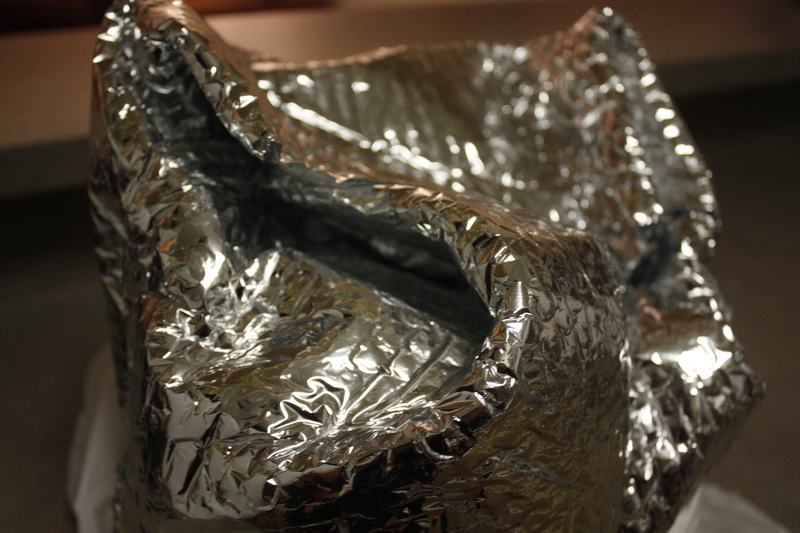 When oil is shimmering (awesome tip), add salmon, ﬂesh-side (skin-side) down, and cook until golden, about 3 minutes. Flip and cook until skin is crisp, 3-4 minutes more. (We used our phone timer to keep our timing quite accurate, which yielded a perfectly blackened and flakey salmon). 6. Plate Salmon Divide potatoes and kale evenly between 2 plates. Top with salmon and garnish with lemon wedges. Sprinkle Maldon salt over salmon and serve. We can’t iterate enough how delicious the sum vs. the individual ingredients were. Our first Plated meal from preparation to consumption was a sheer pleasure and makes us not only look forward to the salmon leftovers, but the next plate, making and enjoying the creamy coconut curry.